During the first launch of AD FastReporter Pro, you will be prompted to enter the product activation key. If product key is invalid, you will see a red exclamation point! Please contact us if you have any problems with your product key.. 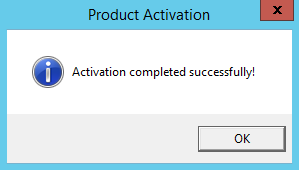 If product key is valid, you will see a confirmation message - AD FastReporter Pro version is now fully activated.